This entry is part 10 of 13 in the series Magento 2 for PHP MVC Developers. Earlier posts include Introduction to Magento 2 -- No More MVC, Magento 2: Serving Frontend Files, Magento 2: Adding Frontend Files to your Module, Magento 2: Code Generation with Pestle, Magento 2: Adding Frontend Assets via Layout XML, Magento 2 and RequireJS, Magento 2 and the Less CSS Preprocessor, Magento 2: CRUD Models for Database Access, and Magento 2: Understanding Object Repositories. Later posts include Magento 2: Admin Menu Items, Magento 2: Advanced Routing, and Magento 2: Admin MVC/MVVM Endpoints. The Magento backend application, (sometimes called “The Admin” or adminhtml area), is where a system owner manages their Magento store. This is where users interact with web forms to add new products, change configurations, etc. Magento is a multiuser application — i.e. a business owner may have a backend account for herself, but also give each individual member of her staff an account to access the Magento backend. Furthermore, that business owner can turn off features for different accounts. For example, the customer support staff may only have access to the customer and orders sections, while the sales staff may have access to both these sections and the marketing section. 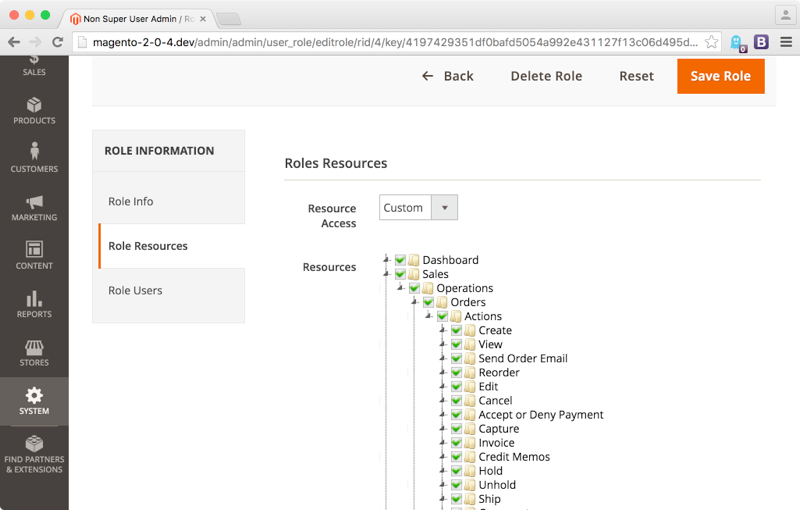 In the Magento backend, a system owner can accomplish this via the System -> Users and Systems -> Roles sections. These two sections implement an authentication and authorization system. For those of you too busy to read the wikipedia article, authentication is the act of ensuring a user is who they say they are. In simplified terms, this is the user entering an account name and password in a login screen. Systems with a higher level of general security or special PCI compliance requirements are often required to implement two factor authentication. A common two factor authentication process is a password, combined with an SMS/Text message sent to their phone. Create an unlimited number of logical Roles. Some example of roles might include Sales Staff, Support Staff, IT Staff, Contract Developers, Executive Team, etc. Each individual rule controls access to a system feature. Tailoring a set of rules into a set of Roles that an individual business can use to run their online store is one of the many things a Magento system integrator or store owner will need to do. The special Resource Access: all role is a super user role. These users are granted access to every resource in the system. Every URL endpoint/controller in the admin application must implement an _isAllowed method that determines if a user can access the URL endpoint. Despite being required fields, there are no hard and fast rules as to how a module developer should setup and structure their own rules. Also, a module developer will likely want additional rules that are specific to their module. This article can’t answer these hard questions for you, but we will show you how to check the current user against a specific ACL rule, look up ID values for existing rules, and how to create your own tree of ACL rules. The ACL rule with the title “Google API” has an ACL ID of Magento_GoogleAnalytics::google. This is the ID you’ll use to check if the logged in user has access to this resource. Item id attribute can has only [a-z0-9/_]. Minimal length 3 symbol. Case insensitive. All in all, while it’s possible to deviate slightly from Magento’s convention, it’s best to stick to it. If you’re curious about the placement of the Magento_GoogleAnalytics::google rule inside the node structure of acl.xml files (i.e. what are its parent nodes), an acl.xml file is an infinitely deep XML tree of <resource/> nodes, with each node defining a new level in the ACL hierarchy. If that didn’t make sense, don’t worry, we’ll be running through a few examples later that should clear things up. Before we move on to creating our own ACL rules, Magento 1 developers will want to take note. Magento 1 ACL rules did not have an explicit ID. Instead, the system derived an ID from the names of the XML nodes that defined the rules (i.e. foo/baz/bar). This means, in Magento 2, you can no longer look at an ID and be sure where it lives in the hierarchy, you can only be sure of the module that created it. This searches every acl.xml in vendor/magento for the string Google API. 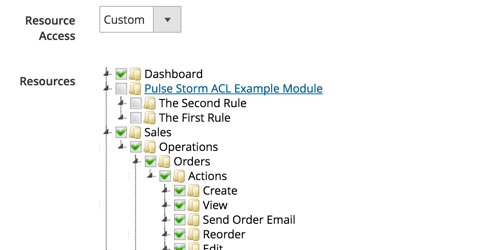 When you create Magento admin features, you’ll need to add ACL rules to your module. We’re going to show you how to do this using pestle, and then explain what each file pestle created is for. If you’re not familiar with it, pestle is a free and open source PHP command line system that features a number of useful Magento 2 code generation tools. First, we’ll want to create a blank module named Pulsestorm_AclExample. You can create the base module files using pestle’s generate_module command. Next, we’re going to use pestle’s generate_acl command. The first argument (Which Module?) lets pestle know which module’s acl.xml file it should use or create. The second argument (Rule IDs), is a comma separated list of Rule IDs — each comma represents a <resource/> sub-node in acl.xml. Here you can see pestle created a Pulsestorm_AclExample::top rule that’s a parent of the Pulsestorm_AclExample::config rule (i.e. the first two rules in our comma separated list). You’ll also notice pestle created both these rules under the Magento_Backend::admin resource — all Magento ACL rules go under this node — it’s the top level node. And, while we’re at it, lets add a second rule! That’s all there is to it! Your rules can now be assigned to admin roles in the system, and those admin roles can be assigned to users. The following assumes some base familiarity with Magento’s object and automatic constructor dependency injection systems, although if you’re not 100% comfortable with these concepts, just power through for the code snippets you’ll need! If you’re in a controller that extends the \Magento\Backend\App\Action controller, you automatically have access to the authorization checking object via the _authorization property. Regarding the controller method above — if you’re injecting additional arguments via the __construct method, don’t forget to include the admin context object (Magento\Backend\App\Action\Context). This context object is where the auth checking object is, itself, instantiated and injected. If you’re having trouble with ACL rule debugging, this is where you’ll want to start. Access Control Rules are an important, but often overlooked part, of Magento extensions. While an extension’s functionality and ability to solve a business or technical problem is paramount, giving your extension users the ability to turn certain admin features on and off for certain users can often be the differences between a manager or store owner choosing your extension over a competitor’s. However, even if you don’t want to slice your extension’s functionality into narrow bands, there are places in the Magento Admin where you’ll need to add ACL rules. Next time we’ll explore one of these sections, when we cover how to create Magento Admin MCV/MVVM controller endpoints.